If you are not in the mood for corned beef and cabbage this St. Patrick’s Day how about a beef soup that you can start the night before and throw it into the slow cooker before you head out to work. 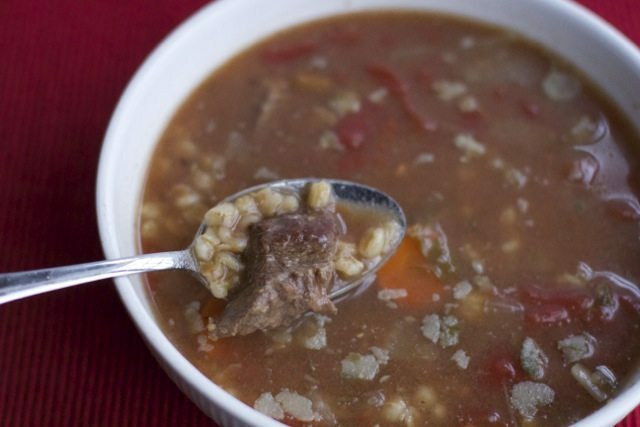 This slow cooker soup recipe takes a little longer than I like for a weeknight meal because you need to brown the beef but it isjust what the leprechaun ordered. I am sure this slow cooker Beef and Barely Soup recipe will be a keeper for your St. Patrick’s Day Menu. Then just dump all your canned ingredients into your slow cooker and let it do it’s magic. This was our first beef soup recipe and we found it not over powering. The Barely and veggies were perfectly cooked, although we might add more carrots. Dry the beef with paper towels, then season with salt and pepper. Heat 2 tsps of the oil in a 12 inch skillet over medium high heat until just smoking. Brown half of the beef, about 10 minutes then add to the slow cooker. 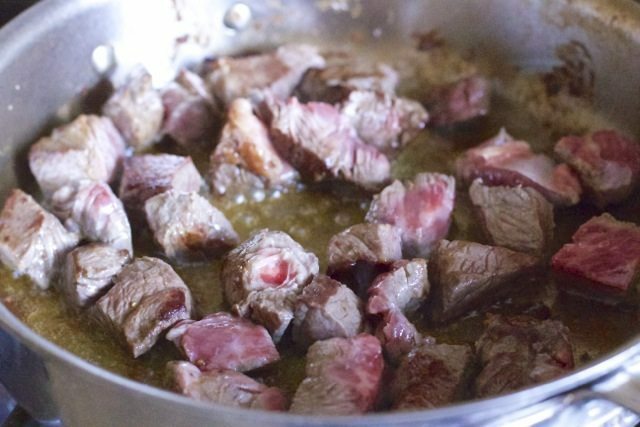 Return the skillet to medium-high heat and repeat with 2 more tsps oil and the remaining beef. Add the remaining 2 tsps oil to the empty skillet and heat over medium heat until shimmering. Ad the onions, carrots & 1/4 tsp salt. Cook until the veggies are softened about 5 minutes. Stir in the wine, scraping up any browned bits. Simmer until the wine has reduced to 1/2 about 1 minute then pour into the slow cooker. Add the tomatoes with their juice, the broths, thyme and barely to the slow cooker. Cover and cook, on either low or high until beef is tender, 6-7 hours on low or 4-5 hours on high. To make this ahead, brown all the beef,and cook the vegetables cover and refridgerate until the next morning. looks great; i love to make soups in a slow cooker. 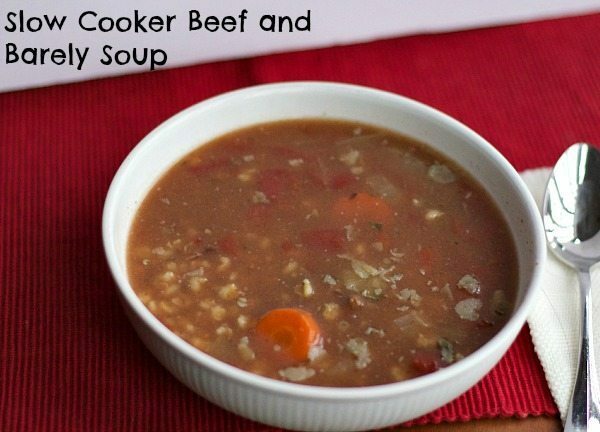 I love Beef and Barley together and this soup looks so delicious and I want to make this for a nice healthy dinner. Thanks for sharing! I like barley and beef soup. It’s comforting and filling. it is really a yummy recipe, picture does not do it service. I love all recipes that allow me to use my slow cooker, and I know my little one’s won’t be eating corned beef and cabbage on St. Patrick’s Day so I think we will try this recipe instead! Thanks!